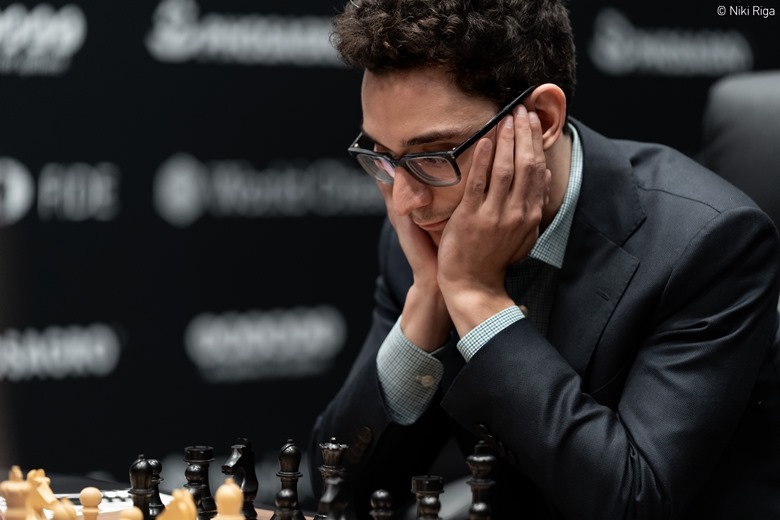 Just as in New York two years ago, Magnus Carlsen has now drawn the first 7 games of his title defence, with Fabiano Caruana looking more comfortable by the day. In Game 7 we got the same Queen’s Gambit Declined as in Game 2, until Magnus varied on move 10 only to immediately get surprised himself by the response. Alexander Grischuk was scathing of what he called, “childish preparation”, but at least the World Champion managed to retain a small edge. It came to nothing, however, as he confessed afterwards that his play had been “way too soft”. 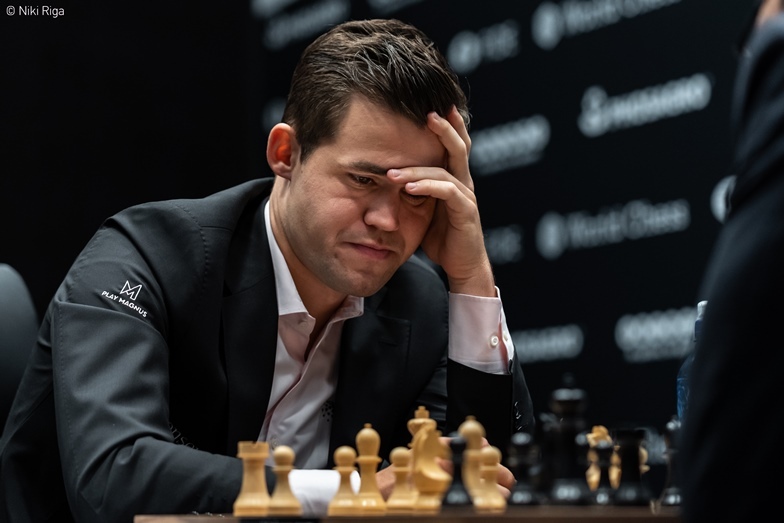 After Magnus Carlsen started his first three games with the white pieces 1.d4, 1.c4 and 1.e4, it would have been amusing if 1.f4 had made an appearance in a World Championship match, but instead in Game 7 it was a return to the 1.d4 of Game 2, and the relatively quiet waters of the Queen’s Gambit Declined. He still got shocked on move 10, though, since with barely a pause for thought Fabiano retreated the queen that had just come to a5 back to d8 with 10…Qd8, a move that sent Magnus into a 9-minute think. He would say afterwards in the press conference, “I knew that the move existed, I just didn’t expect it”. We have another childish preparation by Magnus. When you’re preparing it should be like digging. When you dig a big hole you go the widest at the surface and the deeper you go the smaller it becomes, but his preparation is more like when you have a light, then actually the further you go the wider will be the light. Every time he just misses a move on move 1 or move 2 of his analysis with White. The most important thing is to check all possibilities at the very early stage, and then the deeper you go the less important it becomes. A lot of people do this mistake – they just start to analyse too late. You should start from the very beginning. It seems like already 10…Qd8 shocked him. 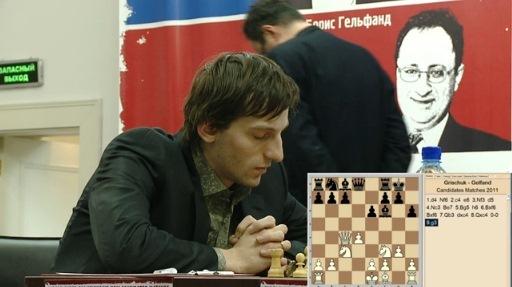 Grischuk: You remember when once in the Candidates in 2011, when I was playing the final against Gelfand, I told you, “you don’t have to go deep, but just please analyse c5, e5 and b5 on every move”. Svidler: I actually don’t remember you saying that. I trust that you did tell me that, but c5 and e5 registered in my head, and b5 just didn’t register. Grischuk: And then of course he plays b5 on move 2 of our analysis, and already White has to fight for equality! 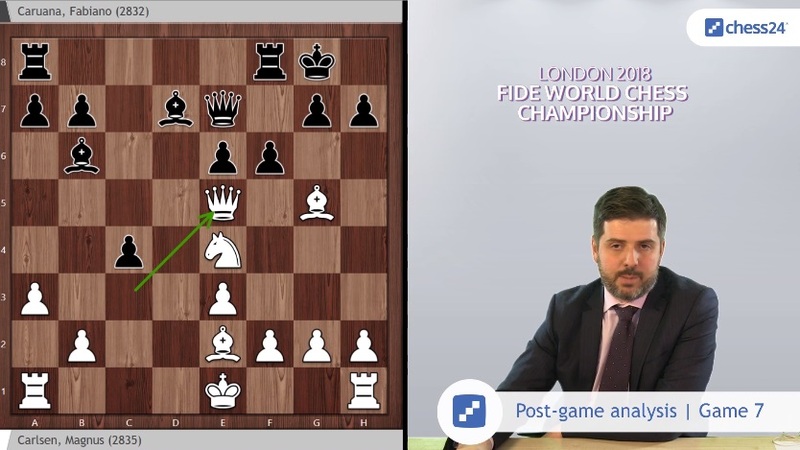 Svidler: I’m very famous for being a perfect second! No blemishes on my seconding career whatsoever. Don’t listen to this, people. Everyone should hire me instantly. I’m very open for offers. Actually I think the level of play is very high, there are very few mistakes, and the level of preparation with Black is very high. It’s just still I cannot believe you cannot find anything with White – just any one idea! 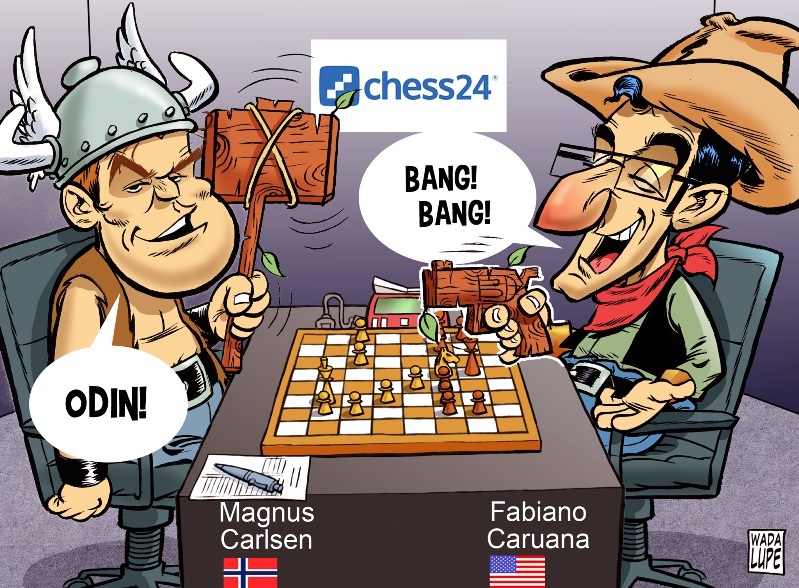 This is probably a very serious idea from Team Caruana. It doesn’t appear to be only good for one game - it appears to be an actual very, very serious new approach to an old line. It wasn’t too much of an unpleasant surprise, since I felt like there should be many safe options for White, and perhaps some chances to play for something, but what I did was just way too soft. Then I had one chance to play actively, but I didn’t entirely believe in it. 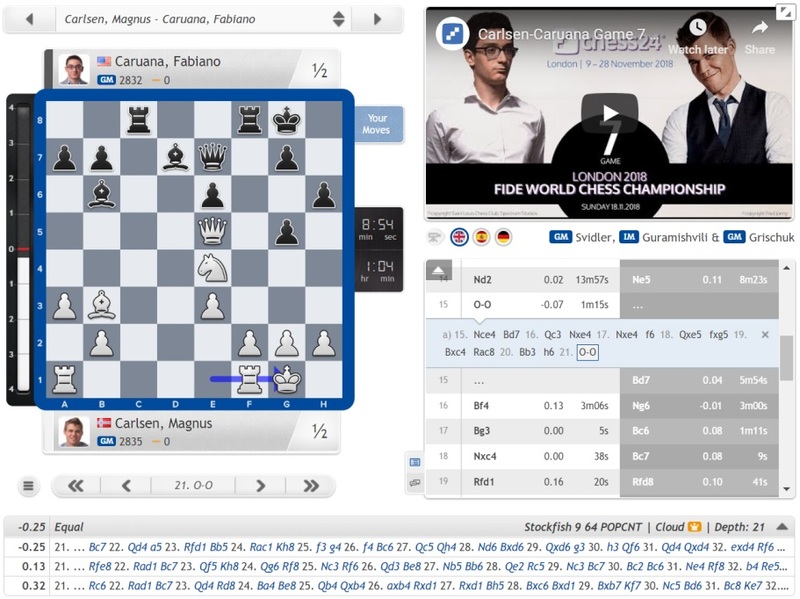 In his recap video Svidler notes that the computer coolly plays 18…Bc6! now, while Fabiano had prepared the line 18…fxg5 19.Bxc4 Rac8 20.Bb3 h6 21.0-0 and, “we get this position which is rather unusual, but if White consolidates this then it could potentially get a bit unpleasant for me”. 24…Bb5!, with the plan of exchanging the bishop for the knight, and also another pair of bishops, would have given Black a symmetrical position with the usually superior queen + knight against queen + bishop. It was hard to imagine he could be worse there, but instead Fabiano quickly played 24…Bxg3!? 25.hxg3 Qd7!? I played a bit carelessly near the end and got some slight pressure, which I didn’t expect, but still it was always very much a draw. I was hoping to outplay him in the ending with knight against bishop, but I don’t think there was anything there. So Magnus had failed to make anything of the sequence of having two white games in a row in the middle of the match. After the last game it kind of felt like I got away with murder, and in that sense it’s easier to be calm about a draw today. I’m not loving it, but I’m not in any sort of panic mode either. It could have been worse, and the match is still equal, and with Black it’s going ok. I’m not at all thrilled about my play today, but yeah, life goes on - it’s not a big deal. Let’s hope for a slightly livelier encounter! It’s going to be an intriguing battle whatever happens, and once again Peter Svidler, Alexander Grischuk and Sopiko Guramishvili will be at your service to commentate on the whole game (Anish Giri joins from Wednesday onwards!) live here on chess24 from 16:00 CET.